A few of us annually head away for a few days holiday with the kids – it’s nice to go away in couples, the mums get some time, the dads get drunk and the kids get to play! We usually head to Abersoch and that area, but as our broods are increasing year on year (there were two new babies this year, to add to the 5 toddlers! ), it’s been harder to find somewhere big enough to house us all that doesn’t involve us selling a kidney! Our friend Polly was on the hunt this year and she did us proud, finding a total gem in the Welsh coastal town of Criccieth. We stayed in a Victorian terraced house, overlooking the beach, which had plenty of bedrooms (all ensuite!) for us to make ourselves at home in. The best part of the whole house? The 1st floor lounge that had uninterrupted views of the sea – perfection. So because of our imminent arrival, we had to bring our annual trip forward by a month or two (sorry gang! ), which meant we were playing Russian roulette when it came to the weather. Although we did expect some sunshine, as March is usually pretty good in the UK…you know we get a few sunny days and get carried away thinking it’s only upwards from here and we’ll have a Mediterranean summer ahead of us…then we wait and wait and the months go by and we never do get that heat wave…I digress. Although we had spells of glorious sunshine and blue skies, it was interspersed with snow and freezing cold winds (damn you Beast from the East!). It really was quite bizarre. One minute we were in cardys, strolling along the beach and the next we were running for cover and wrapping-up warm in 10 layers. But you know what, it didn’t matter! Just being with the kids outdoors, in the fresh air, on an empty beach for the weekend was bliss! Being 33 weeks’ pregnant at the time, I was in need of a break, a change of scenery and some headspace. Although holidaying with 5 toddlers and 2 babies isn’t entirely relaxing, it is fun and it did make me put my work to the back of my mind for a few days! I really have learned that being out in the elements, particularly by the sea, is good for me both physically and mentally. Being a city-slicker, born and bred, the outdoors hasn’t always been high on my agenda. But since having kids, I’ve realised that the simplicity of a coastal walk is all you need to make you feel happy and healthy. 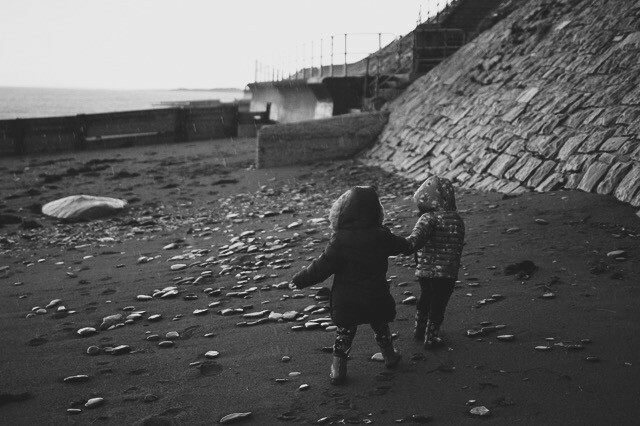 It’s become a real desire of mine to spend more time in places like Criccieth with our family and friends and I love the joy it brings our daughter. There’s nothing quite like collapsing on the couch after a brisk walk in the sea air. We really can’t wait to go back next year and I look forward to adding to my series of UK family holidays by the sea, as we discover more beautiful places to visit.